After winning a good amount of Game of the Year awards, I decided to see what all the fuss was about with The Walking Dead. The game is divided up into five episodes that each cost 400 points on the XBOX Live marketplace. I have played some great games from the marketplace, but nothing too exceptional. This game, all five episodes, was exceptional. The Walking Dead is essentially an adventure game, and if you grew up on computers in the 90s you probably played many games just like it. You usually pick between three answers to reply to another character, and you interact with people and objects to move forward in the story. Some parts are simple, others take time to piece things together so you can move on. You begin the game in the back of a police car during the early stages of the zombie outbreak. You converse with the police officer transporting you when suddenly the vehicle collides with a zombie and you the car crashes over the hill. With the officer who transported you dead, it doesn’t take long before he is coming for you. Like this scenario, the game puts you in many fast-paced situations where you must piece things together quickly to survive. After you defeat that zombie you are chased by many others into the backyard of a suburban home. 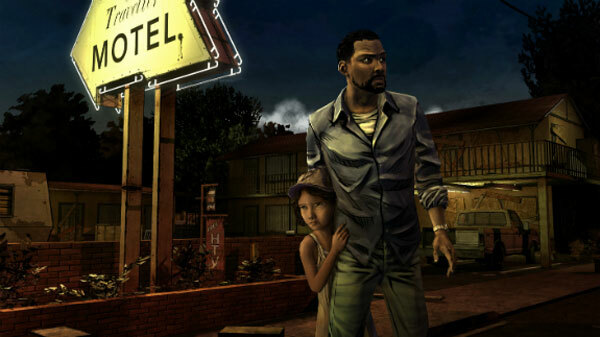 You discover that a little girl named Clementine is hiding out in a treehouse and her parents are no where to be found. You decide to take care of her as you adventure on and begin forming your own group of survivors. During the course of the game you are require to make morally difficult decisions, often with little time. You may have a character die in your game that didn’t die in your friends game. The sustained goal being to protect Clementine no matter what. Episode One really got me into the gameplay and the early stages of the story. But it wasn’t till episode two that I was really encompassed. The story takes some turns into the harshness of the zombie apocalypse. Episode Three was more action-packed and a prelude to the major finale that the final two episodes provided. The whole story was so well-told and poetic, almost enough to drive tears from your eyes in the final moments. While the gameplay is enough to make this game a spectacle, the story is truly what sold me. Usually in zombie movies/video games we are bombarded with gratuitous gore and a hackneyed storyline built around it. This game contains some of the goriest and disturbing images ever displayed in a zombie video game, but it never feel gratuitous, it feel poetic. The zombie apocalypse genre is wearing thinner and thinner each day, but the group at Telltale games has managed to weave out the cliches of the average zombie flick, and avoid the dreary slow-paced moments of the early seasons of The Walking Dead (The Show). The game has exceptional, heart-racing moments of action with time to breath in between. I cared so much about my goal to protect Clementine in this game, that in between Episode Four and Five I would go to bed worrying about her. With all this said, yes, I absolutely loved this game, deserves every ‘game of the year’ title it receives. I passionately recommend it to all fans of video games and storytelling in general.